This one is all about summer. 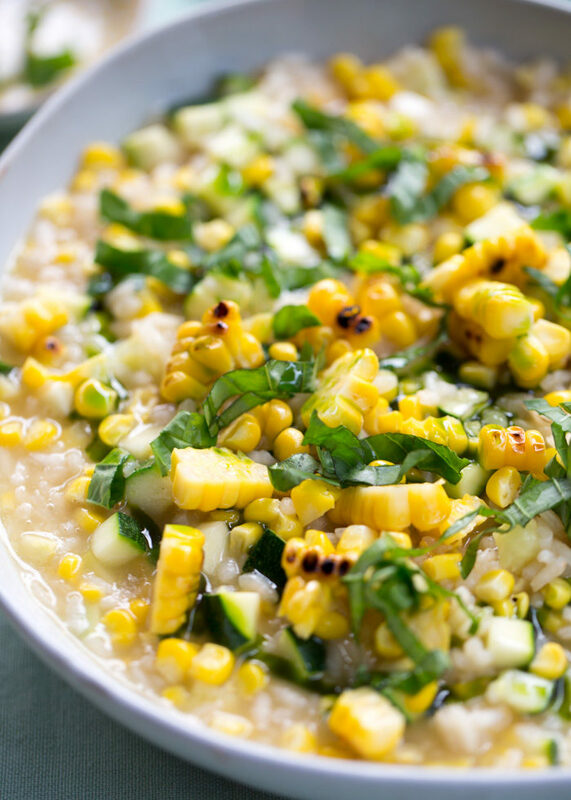 Sweet corn right off the cob, fresh zucchini, and a gorgeous green basil oil to finish. A risotto that’s worthy of a special occasion but also equally perfect for a simple one-pot weeknight dinner! I admit it. Up until recently, I thought one of the main secrets to risotto’s creamy, dreamy consistency was a hefty dose of Parmesan cheese. Oh and butter, too. My first lesson to the contrary was when I made this vegan risotto. Deee licious. My slow realization that vegan risotto can indeed be just as incredible as its dairy-filled counterpart was confirmed when I made a vegan risotto as part of an assignment in the plant-based cooking course I recently took. So what is a good risotto all about then, if not the parm? Here’s what I’ve learned. Well, first, of course, you need the right rice. Something short-grain and super starchy – the usual suspect is arborio rice. You know how you usually rinse rice before cooking it? Don’t do that with risotto rice! You want those starches. The starches are where it’s at. Starches = creamy. Otherwise, we’re talking about careful treatment of the ingredients. Let the onions sweat – cook ’em low and slow. Toast the rice. Deglaze with a nice dry white wine. Perhaps use a special broth. And then exercise a bit (okay, a lot) of patience. Add the broth one cup at a time, waiting until it’s completely absorbed before adding more, coaxing the creaminess out of the rice. And guess what? 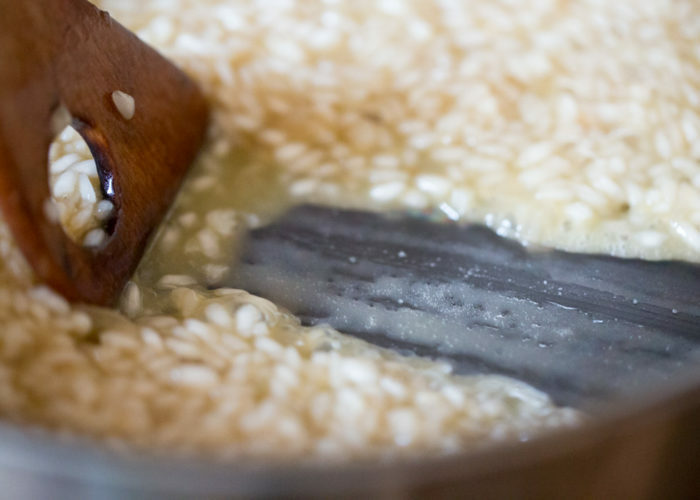 These simple guidelines around a great risotto don’t involve parmesan! The right ingredients, the right treatment of ingredients, a little patient coaxing. So now I know. 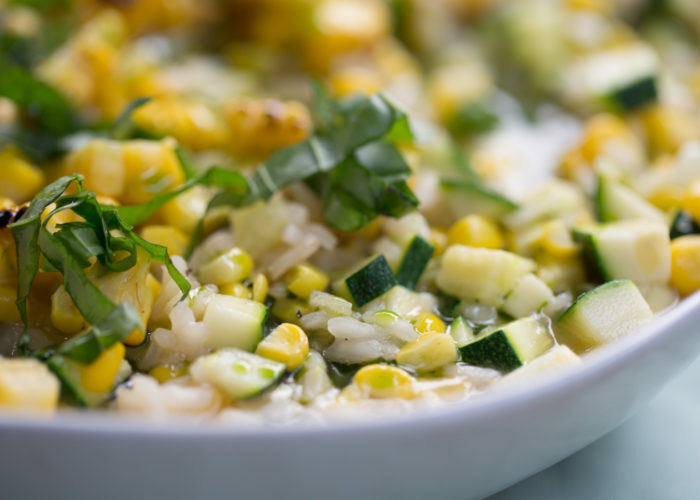 And now I share this perfectly creamy vegan risotto recipe with you. So what’s in this version aside from the usual risotto suspects? Some zucchini to add color, a bit of texture, and to up the summer quotient. And, finally, a finish of the most vibrantly green basil oil along with some charred fresh corn to top it off. 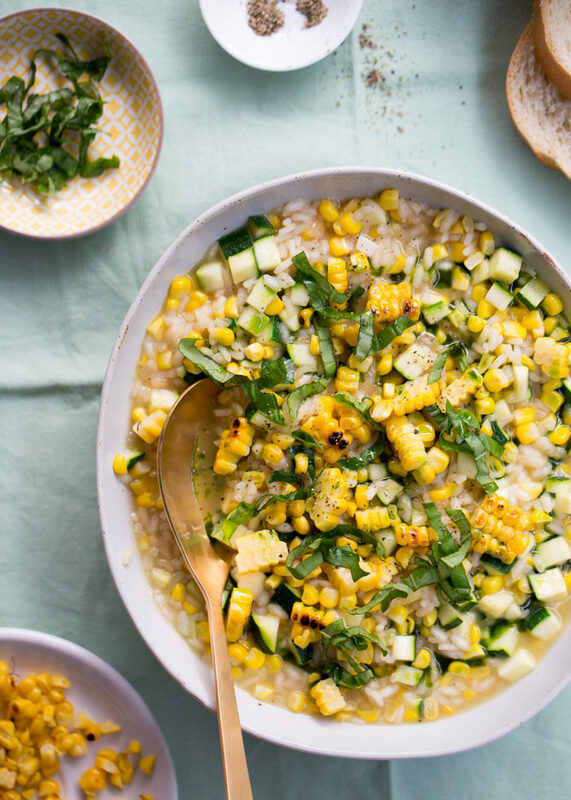 This Sweet Corn Risotto is a hearty summer dish that’s both vegan and gluten-free – and a total crowd pleaser to boot. Make the basil oil (preferably a day ahead of time). Bring a medium pot of water to a boil. Prepare a medium bowl of ice water. Wash the basil and remove leaves from the stem. Add the basil leaves to boiling water. Remove leaves after 10 seconds and plunge into the ice water to stop it from cooking. Shake off the basil and place between paper towels. Squeeze to get as much water out as possible. 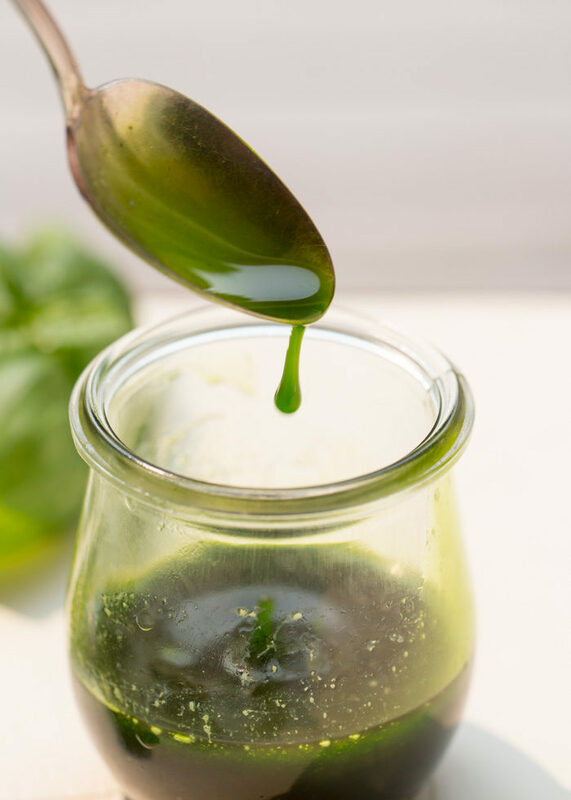 Add basil to the pitcher of a blender along with the olive oil and grapeseed oil. Puree. Pour into an airtight container and refrigerate overnight for deepest flavor. Or, if short on time, continue to the next step. Place a cheesecloth over a fine-mesh sieve. Pour the oil over the top (bring to room temperature first if it was refrigerated). Gently squeeze the cheesecloth to get as much oil out as possible. Discard the solids. Pour the oil into an airtight container and store in the refrigerator until ready to use. Keeps for up to four weeks in the refrigerator. 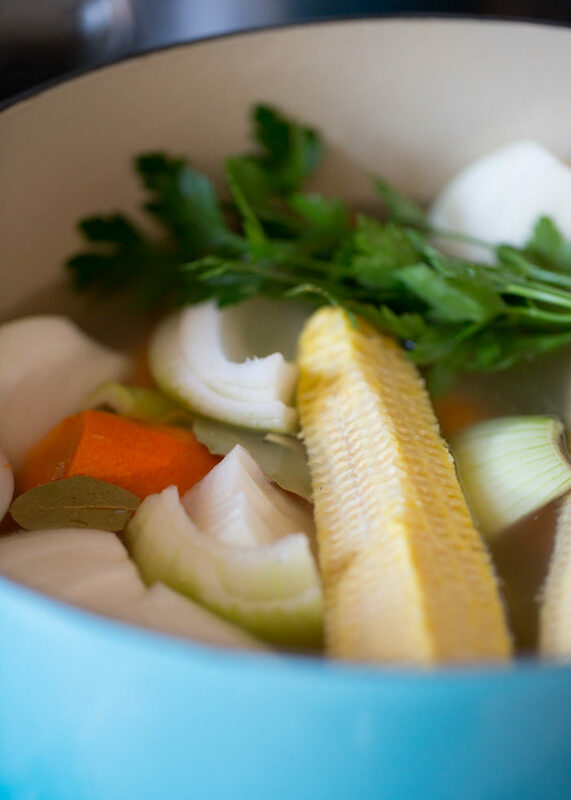 Make the vegetable broth. Cut kernels off of two ears of the corn. Reserve the corn kernels for the risotto. Add cobs to the a large dutch oven or stock pot. Add carrots, celery, onions, parsley, peppercorns, and bay leaves. Bring to a boil. Reduce to a simmer and cook, stirring very gently only occasionally, until the vegetables are soft – about 35 minutes. Place a colander over a large bowl and strain broth through the colander. Rinse out the pot, then place a fine mesh sieve over the pot. Strain the broth through the sieve back into the pot. Discard solids. Add 1 teaspoon salt and stir to dissolve. Prep the risotto. First, grill one cob of corn to use as a garnish later on. To do this, remove the husk, rub with olive oil and sprinkle lightly with kosher salt. Heat an outdoor grill or an indoor grill pan on medium high. Cook the corn, turning occasionally, until tender and some of the corn kernels are blackened. Remove from heat and set aside. 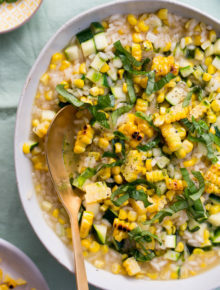 Have the rest of your ingredients ready before starting – the kernels removed from the two remaining ears of corn, garlic minced, wine and rice measured out. Make the risotto. Place a medium saute pan over low heat. Add olive oil, onion, and a pinch of kosher salt to help draw out the flavor and moisture. Gently sweat the onion (it should just barely sizzle), stirring occasionally, until tender and translucent, about 15 minutes. If your onion starts to brown, turn down the heat. Add 1/4 cup warm broth to further soften the onions. Cook, stirring occasionally, until the liquid evaporates. Next, “toast” the rice. Increase heat to medium. Add the rice and cook, stirring constantly, until the edges of the rice are translucent, about 4 minutes. Be careful not to scorch the onions or rice; if they start to brown, reduce the heat. Add the garlic. Cook, stirring, for 30 seconds. Pour in the wine and cook, stirring, until it has absorbed. Add one cup of the broth and cook, stirring frequently but not constantly, until the liquid has absorbed/evaporated completely. The rice should bubble gently consistently – adjust the heat if needed. Add one more cup of broth and cook, stirring frequently, until evaporated. Add the next cup of broth, then stir in the corn. Continue cooking until evaporated and add the fourth cup of broth. This whole process should take about 15 minutes. After the fourth cup is added and/or the 15-minute mark is reached, taste the rice. If it’s al dente (“to the tooth”), it’s done! If not, add a bit more broth and continue to cook until the rice is tender and the risotto is loose. Note: If you run out of broth, you can always add some warm water in a pinch to finish cooking. Stir in the zucchini. Taste and season with salt and pepper if desired. Spoon into serving dishes. 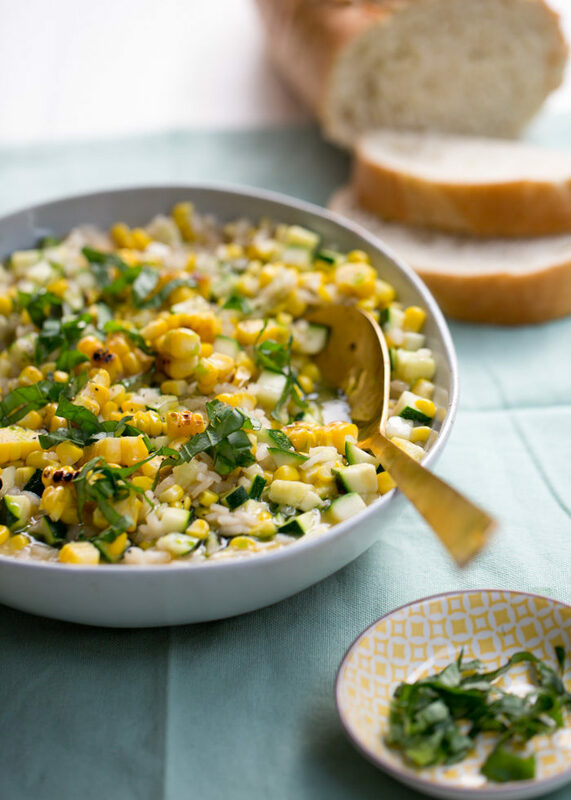 Garnish with charred corn kernels, a generous drizzle of basil oil, and fresh basil. Serve immediately. Recipe time includes making the broth. It does not include the recommended refrigeration time for the basil oil. To simplify this recipe, substitute store-bought low-sodium vegetable broth and skip the basil oil and extra corn garnish. 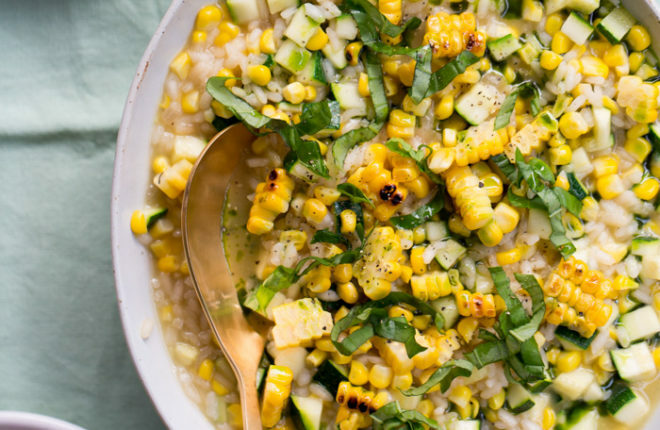 Simply make the risotto and garnish with a pile of basil and perhaps a drizzle of extra virgin olive oil. It will still be delicious!